LA VERNE, California, January 25, 2018 — Boy, have I been adrift at the ship’s wheel. In my current explorations of Newport Beach, where half of La Verne likes to spend its summer renting beach houses or owing them if you’re among the upper 1 percent, I came upon a California-casual, pop-in, sit-down, no-muss, no-fuss, be-on-your-way fish eatery in the Lido that didn’t bust my lunch budget. Turns out Bear Flag Fish Taco has been open in the Lido location (3421 Via Lido) since 2007. I guess I was so occupied back then with the financial crisis that I never bothered to notice. That, and I usually headed farther out on the peninsula to Marlarkey’s Irish Pub for my food and libations. When I walked into Bear Flag on a Wednesday with son Brett, who works in Newport, I thought I was entering a culinary candy store for adults. 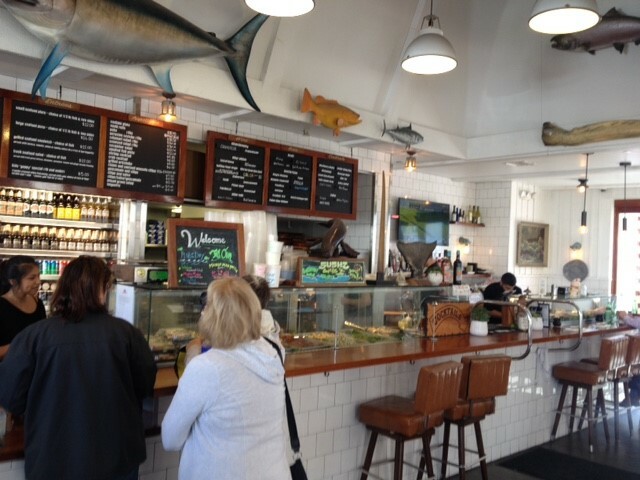 As I waited in line, I couldn’t help but admire the counter to my left filled with the catches of the day: wahoo, opah, grouper, snapper, sea bass, wild salmon, ahi tuna, local halibut and more exotic offerings. When I finally got to the front of the lunch line, I didn’t know what to order. I was suffering from sensory overload. Feeling slight pressure from the mounting line of impatient lunch-goers behind me, I ordered a cup of clam chowder and the Bear Flag sushi roll, a house favorite I was told, while Brett ordered the Bear Flag burrito, stuffed with Panko-crusted white fish with rice, black beans, lettuce, pico de gallo, Tommy sauce (kind of like curried Tapatio) and avocado. The soup came quickly with two generous slices of spongy white bread, perfect for dunking into the hot chowder. Then the sushi and burrito followed promptly. When Brett and I weren’t talking about Vlade’s (Guerrero) pending induction into the Hall of Fame in Cooperstown, we were eyeballing the menu, already planning our next visit. There were salads and sandwiches and seafood platters and a kids’ guppy special (2 panko crusted white fish sticks, served with corn or flour tortilla and 1 side). 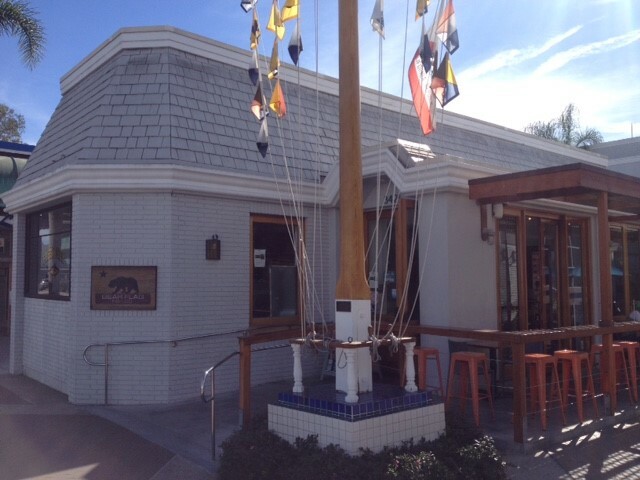 As for the name of the restaurant, Bear Flag, it seemed a little out of place and time. California’s official flag was first hoisted in 1846 in Sonoma, Calif., which has to be 400 miles north of Newport. But then we got the story. Much of owner Tom Carson’s youth was spent on a boat, the Bear Flag, that his dad built and operated as a commercial fishing vessel on trips to the Channel Islands and the seas off Mexico. Carson worked his way up from swabbing decks to serving as chef. “I learned how to evaluate all the quality of the fish, how it was served,” he said. 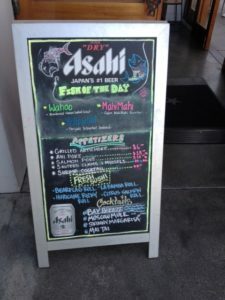 Back on land, that informal training got a boost when Carson worked for a number of top chefs like Tim Johnson at Zenbu Sushi. When he figured it was time to helm his own restaurant, Carson found the Lido location, but knew he couldn’t afford much else, which partly explains the Bear Flag’s spartan appeal. “I couldn’t afford an architect so I did the drawings with a pencil and ruler,” he said, adding that he and his dad soldered all the refrigeration lines in the kitchen. From his time at sea, Carson also learned the virtue of sustainability. So as much as he can, he buys fish locally. Another quality he values is simplicity. Albeit, I have been a late arrival on Carson’s boat, I’m all the the more appreciative for the culinary voyage he is now taking us on. Ahoy, mates, across the street from Bear Flag, lo and behold is Sigal Jewelers. The original, of course, is in downtown La Verne. Drop in and say hello! If you’re fishing for a new home, let Colleen help you reel one in. You can reach her anytime at 626.344.0907. With longtime La Verne Realtor Colleen at your side, it’s always smooth sailing!